"Jason Terry and Jadakiss compete against Jameer Nelson and Bill Bellamy in a CrossFit FaceOFF", YouTube. Active shoulders, eyes looking between the hands and a tight midline make for a stable handstand. CrossFit Games Update: Open Week 5. Chad Vaughn 335lbs, Wes Kimball 305lbs. CrossFit Level 1 Certificate Courses: 3rd Infantry Division, Ft Stewart, GA, CrossFit Singapore, CrossFit Perth, Mundo CrossFit, CrossFit Morristown, River North CrossFit, CrossFit BGI, CrossFit Ramsay. CrossFit Coach's Prep Course: CrossFit Vitality. CrossFit Kids Courses: CrossFit Kingdom. 8 year old Koai'a May. Jason Khalipa 155 reps, Neal Maddox 146 reps, Kristan Clever 137 reps (65lbs). 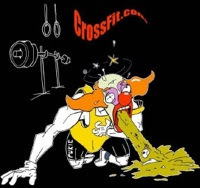 Post rounds and reps completed to comments and/or register and submit your results as part of the CrossFit Games Open. Compare to 110427 and last year's Open. CrossFit Games Update: Open Week 4. Hope poster at Saint Judes. CrossFit For Hope Fundraiser, June 9th. Neal Maddox 2:55, Jason Khalipa 3:44. Workout 12.4 at CrossFit Pearl District. CrossFit Level 1 Certificate Courses: 3rd Infantry Division, Ft Stewart, GA, CrossFit Central London, Colorado State Patrol, CrossFit Oahu, CrossFit Orlando, CrossFit Asia, CrossFit Milford, CrossFit USD, CrossFit - TNT. CrossFit Kids Courses: CrossFit Verve. The NY Times laughably claimed eating red meat increases the risk of death. Fortunately, Zoe Harcombe explains the flaws in their study. Gary Taubes reacts to the bad science rampant in public nutrition: "Science, Pseudoscience, Nutritional Epidemiology, and Meat". CrossFit Competitor's Course, CrossFit Park City. "What is robbing a bank compared with founding a bank?" Graham Holmberg 0 rounds + 25 muscle-ups (265 reps). "Britannica To Stop Printing Physical Encyclopedias, Focus On Digital Archives" by Rob W. Hart, Lit Reactor. "Found a nice park in Bangkok whilst on holidays to do a workout"
CrossFit Games Update: Open Week 3. "Sorrow is the mere rust of the soul. Activity will cleanse and brighten it." CrossFit Level 1 Certificate Courses: 3rd Infantry Division, Ft Stewart, GA, CrossFit Reebok Loreto, CrossFit Effects, CrossFit Charlotte, CrossFit Pardova, CrossFit St Paul, CrossFit Vancouver. CrossFit Coach's Prep Course: Trident CrossFit. "What a man believes may be ascertained, not from his creed, but from the assumptions on which he habitually acts." Tim Banfield, Bugaboo Spire, British Columbia. "Yes, You Can" free CrossFit Journal article by Hilary Achauer. "Fixing America's Freeways" by Robert Poole, Reason. Annie Thorisdottir 13 rounds + 8 push press (20" box, 75lb push press). Graham Holmberg 3:29. Post time to comments. Erin and Carson, Ouray Hot Springs Pool, CO.
CrossFit Games Update: Open Week 2. "The World's Best Personal Security Does CrossFit" by Traver H. Boehm, Breaking Muscle. If you are on the road you can make some subs. Andrew Manderino 16:34, Ryan Johnston 17:29. Post time to comments. U.S. Air Force Major David "Klepto" L. Brodeur, 34, of Auburn, Massachusetts, assigned to the 11th Air Force, based at Joint Base Elmendorf-Richardson, Alaska, died on April 27, 2011 in Kabul, Afghanistan, of wounds sustained from gunfire from an Afghan military trainee. He is survived by his wife Susie, daughter Elizabeth, and son David. "The ultimate aim of the ego is not to see something, but to be something." Rich Froning 98 reps, Dan Bailey 95 reps.
Post reps completed to comments and/or register and submit your results as part of the CrossFit Games Open.